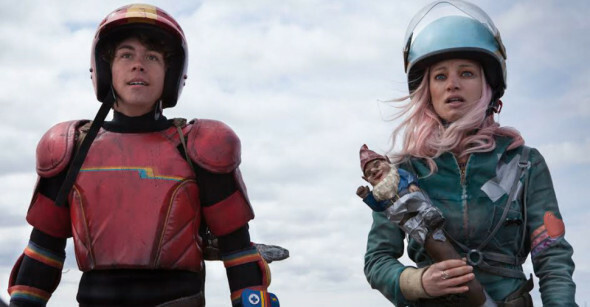 For the 10-year-old boy inside us all, Turbo Kid opens cinematically and on VOD today. It takes us to the post-apocalyptic future of 1997, many years after the catastrophe that destroyed most of humanity, leaving a scrappy few to scavenge for water and survival. The film is expanded from a short originally rejected by the ABCs of Death franchise (in favor of T is for Toilet – eesh). The short is worth a Google, but the full length film is a celebration of early Eighties storytelling and juvenile imagination. It’s a mash-up of the Power Rangers and Hobo with a Shotgun. That is, it’s a perfectly crafted time capsule: a low budget, live action Saturday morning kids show – except for the blood spray, entrails and f-bombs. The Kid (Munro Chambers) wheels around the wasteland on his sweet bike, picking up bits of retro treasure to trade for water, ever watchful for the henchmen of evil overlord Zeus (Michael Ironside). His one real solace comes from the Turbo Man comics he gets in trade for his scavenged booty. When his only friend, Apple (Laurence Leboeuf) – an energetic, teal-wearing girl – is in danger, he becomes Turbo Kid. Together he, Apple, and a mysterious Australian arm wrestler take on Zeus to free fellow survivors from his oppressive, bloody leadership. Writing/directing team Francois Simard, Anouk Whissell, and Yoann-Karl Whissell have crafted a delightfully absurd action comedy. Its 1982-ish panache is joyously spot-on, and the combination of innocence and gore perfectly captures the pre-teen cartoon watcher’s imagination. Turbo Kid is not trying to be Mad Max, though. It’s trying to be the imagined Mad Max (or Indiana Jones or Star Wars or Goonines) game you and your stupid friends played in the neighborhood on your bikes, and it succeeds miraculously because Turbo Kid never winks or grimaces at its inspiration. This is a celebration, not a campy mockfest. Yes, it has trouble keeping its energy for the entire 89 minute running time, but for those of us who took our Saturday morning shows out to the neighborhood streets every weekend, it’s a memory blast.